Analysts are hoping that the long-awaited revival in the mergers and acquisitions market has finally begun. They might yet be disappointed. The recent apparent rise in activity in the global mergers and acquisitions market has set off a wave of speculation that the market may be on the verge of a turnaround. In both the United States and Europe, high-profile announcements have sent shivers of excitement through banking and corporate worlds alike. Deals that have set tongues wagging include Olivetti’s proposed $44 billion takeover of Telecom Italia, Proctor & Gamble’s plan to buy Germany’s Wella for $7 billion, News Corp’s $7 billion acquisition of Hughes Electronics, and Oracle’s hotly contested $6 billion bid to buy PeopleSoft. Not all the discussion has been fo-cused on the possible revival of the M&A; market, though. Plenty of ob-servers dolefully point out that the mar-ket has a long way to go before it match-es—or even comes close to replicating—the frenzied activity of 1999 and 2000. Regardless of whether the optimists or the pessimists are right, one thing is certain: Conditions are near perfect for a global surge in M&A; activity. Edward Hemmelgarn, chief investment officer of Cleveland, Ohio-based Shaker Invest-ments, believes all the factors are in place to trigger strong growth. 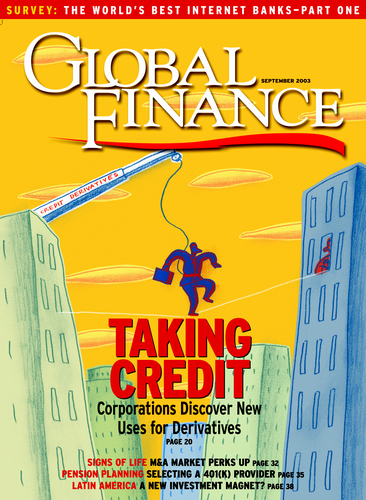 “On a worldwide basis there is a lot of available capital out there. There have been dramatic falls in key short-term rates around the world over the past year.And money supply is rising,so there is plenty of liquidity,” he says. Hemmelgarn also points out that the worldwide econ-omy is more stable than it has been for several years. “The stability is important because it gives businesses the confidence that what they see happening is repeat-able,” he explains. But while many market watchers are confident M&A; activity is on an upward trend, the figures so far this year provide scant evidence that any real growth is occur-ring. Even as analysts were celebrating the early July flood of M&A; announcements, the research firm Dealogic was releasing figures that showed global activity actually fell in the first half of this year compared with the same period in 2002. According to Dealogic’s half-yearly review, global an-nounced-deal value fell 8%, while the total deal count fell by almost a quarter in the first half of the year. Quarter-on-quarter deal value did rise slightly, with $311.2 billion in the second quarter compared with $307.6 billion in the first quarter. M&A; activity in the United States showed a similar trend, although the announced-deal value in the first half of 2003 was sharply lower—more than 16% down—compared with the same period in 2002, while the number of deals rose from 3,478 to 3,516, according to figures from research firm Thomson Financial. The Asia-Pacific region showed more positive signs of improvement. 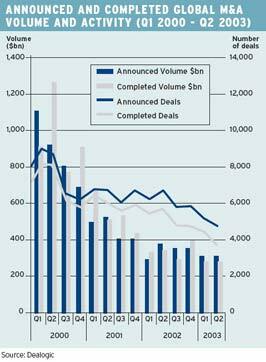 According to Dealogic, first-half targeted-deal value rose 7%, to $112.0 billion from 1,743 deals. The first half of 2002 saw 2,576 deals announced, with a total value of $104.2 billion.And while both the total val-ue and number of deals announced in Europe fell in the first half, European companies were the targets for al-most half of the worldwide M&A; activity. According to Greenspan, corporations’ reluctance to consider mergers or takeovers was just another symptom of the hangover from which business is still suffering.“It’s going to take a while for that to wear off,” he said. With interest rates at such low levels and with many companies sitting on piles of cash, the argument in fa-vor of growth-by-acquisition will be hard to counter for many organizations. Companies looking at buying oth-er businesses in their own industry should be able to persuade investors that the deal will involve relatively low risk and provide a high return on investment.“You don’t have to have a very high threshold to get over to show it will be an accretive acquisition,” comments Hemmelgarn. As a result, observers are expecting to see more cash deals over the next few months, as well as considerably more consolidation in a post-recession shakeout. It is be-coming increasingly clear which players are winners and losers in the major business sectors, making it harder for potential bid targets to defend themselves—and easier for acquirers to justify their intentions.